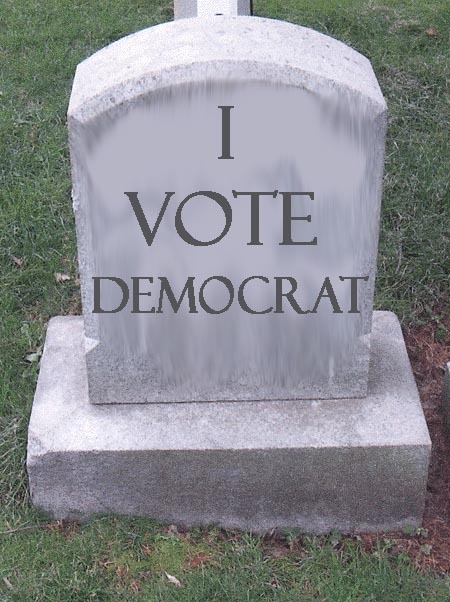 Nearly 2 million dead Americans are still on active voter registries, and 1 in every 8 registrations in the United States is invalid or has major inaccuracies, according to a new study. Research released Tuesday by the Pew Center on the States shows that the country is spending more on voter registration while getting worse results than other nations such as Canada. The study points to antiquated systems that don’t reflect modern technology and fail to address the biggest obstacles to maintaining accurate, up-to-date voter-registry databases. Almost 3 million Americans are actively registered to vote in multiple states, while about 12 million have old or error-ridden addresses listed on their registrations, likely preventing voting-related mail from reaching them. And 1 in 4 eligible citizens — 51 million in total — aren’t registered to vote. The problems aren’t for lack of financial investment: The United States spends 12 times as much to maintain voter lists as its neighbor to the north. A 2008 Pew study conducted in Oregon found taxpayers footing a bill exceeding $4 per voter to keep lists up to date, and the numbers in Wyoming are similar. By comparison, Canada spends less than 35 cents per voter to create and maintain its lists, and 93 percent of its eligible population are registered to vote. Pew’s research suggests that elections authorities need to take a more active approach to rooting out errors and keeping lists current, rather than relying on voters to correct errors and make changes to their registration. Electronic records collection should replace paper forms that lead to errors when officials have to manually enter data from the forms. And data-matching computers should be employed to take advantage of other available government databases that might already contain the correct information authorities need to keep voter records current. Pew commissioned the nonpartisan research firm RTI International to conduct the study, using databases from all 50 states and the District of Columbia.